As we mentioned yesterday, we have partnered up with Whole Foods Market. With this partnership, we will be sharing 5 recipes featuring various types of burgers that can be purchased at Whole Foods Market. Our second burger is our peppery Goat Cheese Montreal Burger! 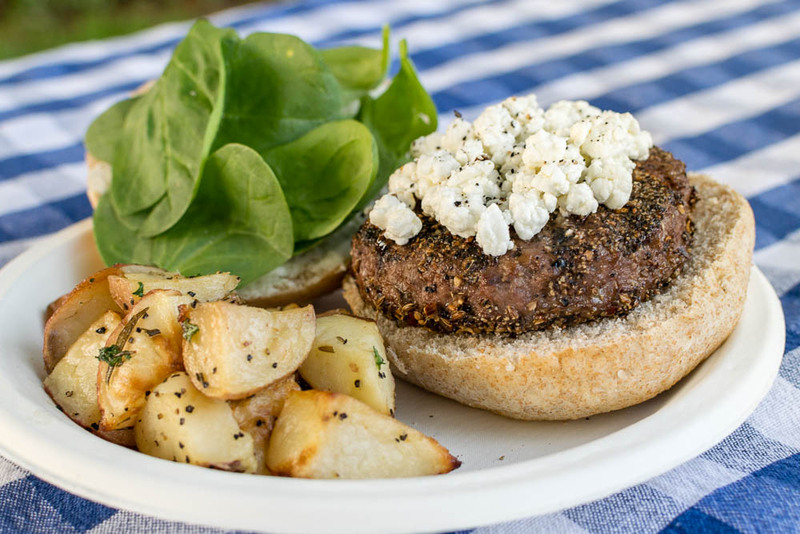 The star of the Goat Cheese Montreal Burger recipe, is the pre-seasoned Montreal Burger patty. Since the burger has a nice pepper flavor, we wanted to “cool” it off. To do this, we used crumbled goat cheese. This tones down the peppery flavor without eliminating it. We also wanted to throw a bit of green in there. Instead of the standard lettuce fare, we decided to use spinach! What is really fantastic about this burger and the other pre-seasoned patties is that they don’t require a ton of extras to taste delicious! There is more to come so be sure to check back tomorrow! The next burger on the line-up is our Vegan Buffalo Burger! You won’t want to miss it (it has kale on it)! What are some of your favorite burgers? We’d love to know! Leave a comment below or use the hashtag #GeekEats! Place patty on the bottom bun. Spread a thin layer of mayo on the top bun. Top with cheese and spinach. You got me at goat cheese! Goes so perfect in a burger and yoru looks amazing. Now I am hungry I wish I coudl have a bite of this goodness. I LOVE goats cheese. And it sure work perfectly in a burger. I love how beautiful yours burger looks. Love the color. We grill at least two times a week, usually a lot more, during the summer! We also have a supply of goat cheese from the Farmer’s Market. We love it added to our burgers! Yours looks so tasty. Goat cheese? Sounds interesting. And with all these ingredients, its yummy. Easy to prepare too. Love it. We simply love goat cheese. I can’t think of anything that wouldn’t be improved with the addition of goat cheese. Your burgers are making me crave one of my own. YUM!! 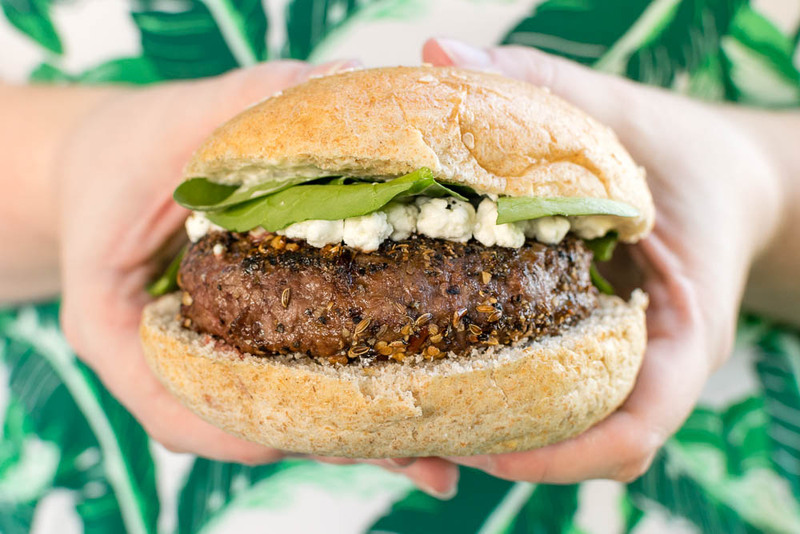 Think juicy burger topped with goat cheese in between a delicious bun. I’m not going to be satisfied until I get me a burger!! This sounds like a great flavor combination. I love goat cheese and it actually tastes so good with meat but I’ve never added it in burgers yet. will try soon. This looks absolutely perfect! I love the addition of the goast cheese…sounds so good! I love a good burger and have them often during the summer months. 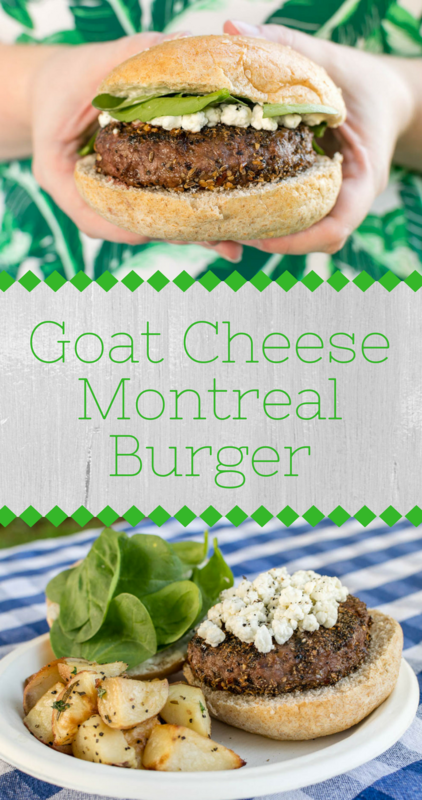 I never thought of preparing them with goat cheese and spinach but the combination has me totally craving a burger right now! anything with goats cheese on it is a winner for me. This is so much better than your usual burger. I never heard of montreal spices. These burgers sound amazing! I love goat cheese, and these look perfectly seasoned! The burger looks delicious. I never had goat cheese before, this makes me want to try it soon. Something different on the grill … we got a new grill this summer and are learning how to use it … so different from our old one. We’ve been on the look out for new recipes to try since we’re grilling so much! Thanks! !